Virginia Gov. Ralph Northam is raising eyebrows with his comments in support of letting infants die after they have been born alive. 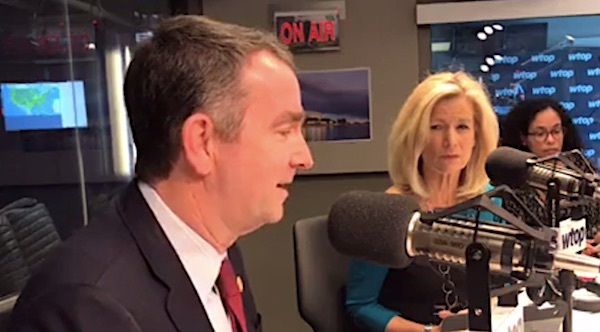 Northam, a Democrat, appeared Wednesday on WTOP Radio to discuss House Bill 2491, also known as the Repeal Act, which would remove all restrictions on abortion in Virginia, even allowing a woman to abort her child while she’s in labor. When asked if he supported the measure promoted by fellow Democrat Kathy Tran, the governor said doctors could make decisions to allow a baby to die even after it’s born alive. The debate in Virginia comes on the heels of a massive expansion of abortion rights in New York, where the members of the State Senate gave a standing ovation upon its passage and Democrat Gov. Andrew Cuomo had buildings illuminated in pink lighting to celebrate the measure. st Rush Limbaugh commented on the trend Wednesday. Limbaugh speculated the political left’s hatred for President Donald Trump has emboldened them, and they feel they “no longer have to trick people,” but can be up front in who they are. Make them applaud what they do, ’cause that’s what they do! They applaud things they like – or make them boo Trump when he says it, or make them get up and walk out. Whatever. The fact is, call the left out on what they’re doing. You got a national TV audience here watching a very controversial, contested State of the Union after the government shutdown. The media’s gonna be driving up audience participation here. They’re gonna be promoting this like crazy. The president ought to call these people out on all these wacko ideas – on immigration, open borders, sanctuary cities – and make these Democrats applaud it, ’cause that’s what happens. They either sit on their hands or applaud. Call ’em out! The Drive-By Media’s not telling anybody what’s going on here! The Drive-By Media’s not telling people that infanticide has just gotten a standing ovation in the New York State Senate. People who live in New York got up one night and they saw the tops of the beings lit up in pink and said, “I wonder what that is?” Well, the New York State Senate just legalized infanticide is what that means. “It is so thoughtful of Gov. Northam to assure us that the baby would be ‘kept comfortable’ before they put him down or let him die,” Donohue said.